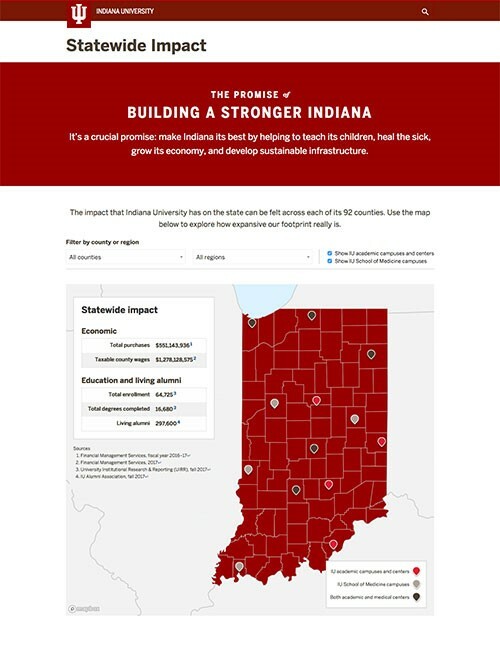 We are pleased to introduce a new web site statewide.impact.iu.edu that illustrates the important impact Indiana University is making across our state. From the number of alumni living in a certain region of the state to the university’s spending by county, the data on the interactive site is designed to provide useful economic information about the university’s reach and its significant investments. The site’s dynamic and intuitive design allows visitors to select a county or region, with associated data appearing alongside a statewide map. Stories of personal impact are also featured. Users can learn about alumna Michelle Dayvault, executive director of Dress for Success Louisville, who has helped more than 700 women in the southern Indiana region take steps toward economic independence. She is just one profile of the many alumni we will showcase. We hope you will find a few moments to visit the site; we will be back in touch as new features are added.